"[There is] no question that the classical and indie realms can share a border where music turns pensive, knotty and otherworldly." Their fifth album, The Creatures in the Garden of Lady Walton (2010), and companion EP, Veil Waltz (2010), were released to great acclaim following their previous album, Lantern (2006). The Creatures is their first album of songs after four primarily instrumental releases; a song-cycle composed by Padma Newsome for the group with extensive vocal work from Shara Worden of My Brightest Diamond. Other guests include Sufjan Stevens, Aaron Dessner and Matt Berninger of The National and the Osso String Quartet. Clogs have performed at the 2013 Adelaide Festival, the 2012 Halifax Jazz Festival, the 2013 and 2011 Ecstatic Music Festivals and 2011 Barbican Centre's Reverberations Festival. 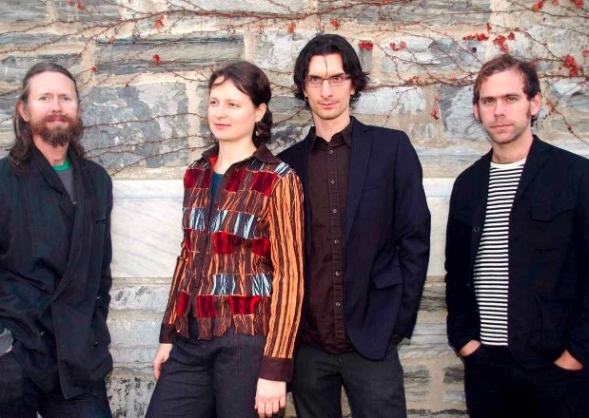 Other noteworthy performances by the quartet have included the 2010 Big Ears Festival, a collaboration with the Brooklyn Philharmonic in 2009 at the Howard Gilman Opera House at BAM, and appearances at the 2007 and 2008 Sydney Festivals. They have performed at such venues/events as the Bang on a Can Marathon, MusicNow Festival, Wexner Center for the Arts, MFA Boston, and the Warhol Museum. Copyright ©2015-2019 Clogs. Site by stephen gilewski design.